Help little alien MOK control a fragile spaceship in a mobile game about exploring hand-drawn planets and saving stranded friends. Be quick but careful as you tap your way through sketchy caverns, putting your skills to the test and collecting extra terrestrial travellers along the way. - Black & white only - no color overload! 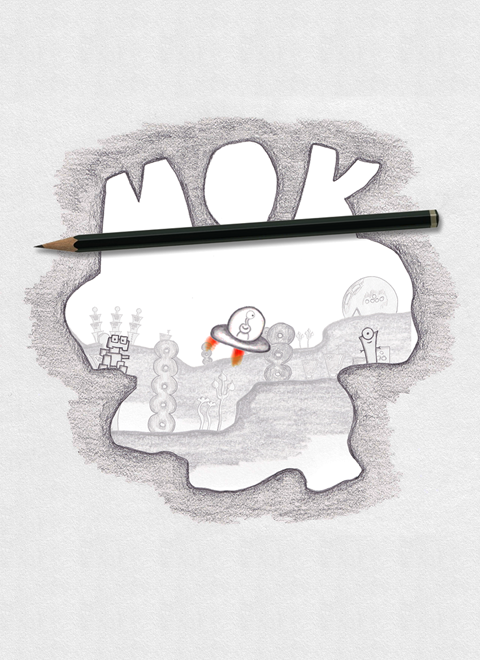 Finally, you can start tapping MOKs little space ship through hand-drawn levels. New alpha 2 released for mobile game MOK - grab it from the play store now while it is still hot! MOK alpha released - get it now for free! Testers appreciated! We made an early version of MOK available online: Feel free to play it if you have a few minutes to try a new game :) Feedback as always is very welcome. I sincerely love the pencil sketched art. Nice work!